Oh my goodness, I can't believe I'm not even kidding. Am I allowed to turn my seven quick takes into a tutorial on how to store Christmas decorations? Will I be thrown out of the 7QT brigade? Will this tutorial make everyone hit the "pin it" button and turn me into one of those bloggers living their fifteen minutes of fame on Pinterest boards all over the world? Does Jen even read this? Answer to all: probably no. I shall not be deterred. 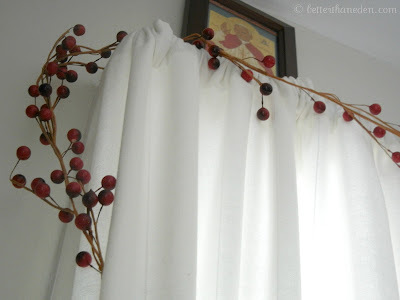 So the other day being Ash Wednesday and all I decided it was time to take down the berry garlands I hang along the windows during Christmas through most of winter. I wasn't sure if I would put them up this year since I went a bit sparser with the decorations over the holiday and had a slight clutter-phobia going on but my husband asked (ASKED) if we could. That is a man confident in his masculinity, I tell you what. Anyway, EVERY YEAR when I take these garlands out they are a tangled mess and the berries get all caught up in each other. That may or may not cause me to get all frustrated and then the detangling causes dozens of painted styrofoam berries to drop off and toddlers then try to eat the made-in-china-probably-have-lead-in-them berries off the floor and then I try not to use bad words while general bedlam commences. Yesterday I realized I could stop all this with a bed sheet. I got out a twin size bed sheet that just so happens to look exactly like a hospital bed sheet. I have no idea where it came from but I promise you we don't generally steal from hospitals. Generally. It may have been planted, I don't know. 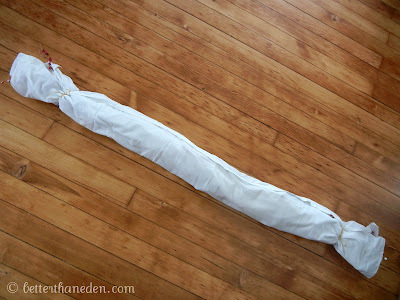 A sheet works great but you could totally use a big piece of fabric, a shower curtain, even a cut up garbage bag if you wanted. If you only have a couple to store, you could even use an old towel. 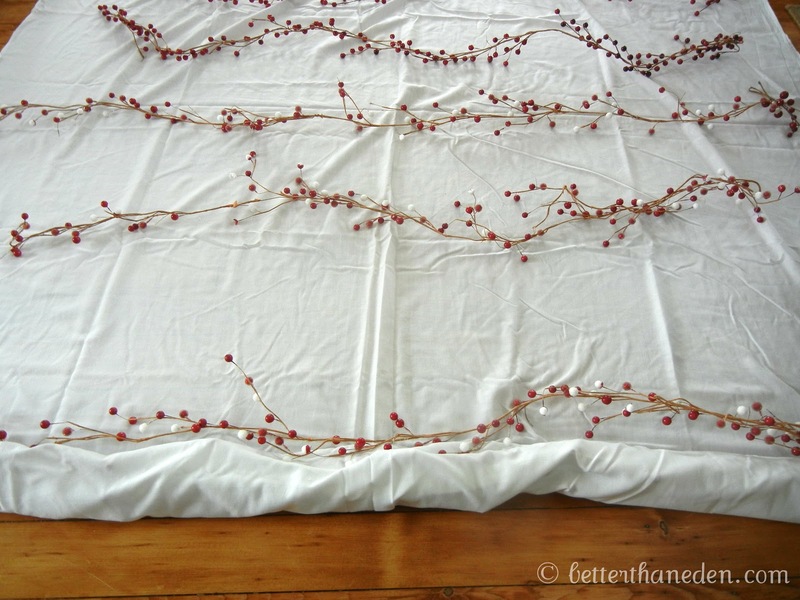 Lay out the sheet and place your first garland near the edge. 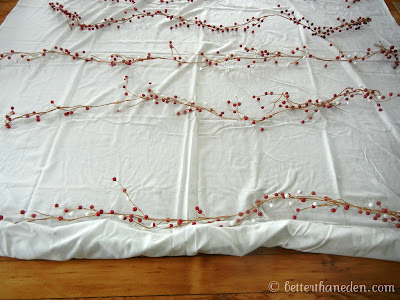 Roll it up so all the berries are covered then tuck in the next garland and repeat. That's it. So simple I wish I had thought of it years ago. 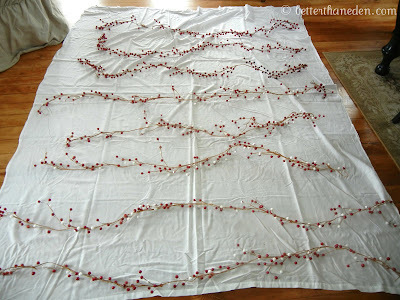 I was able to fit all twelve of our garlands on one sheet. 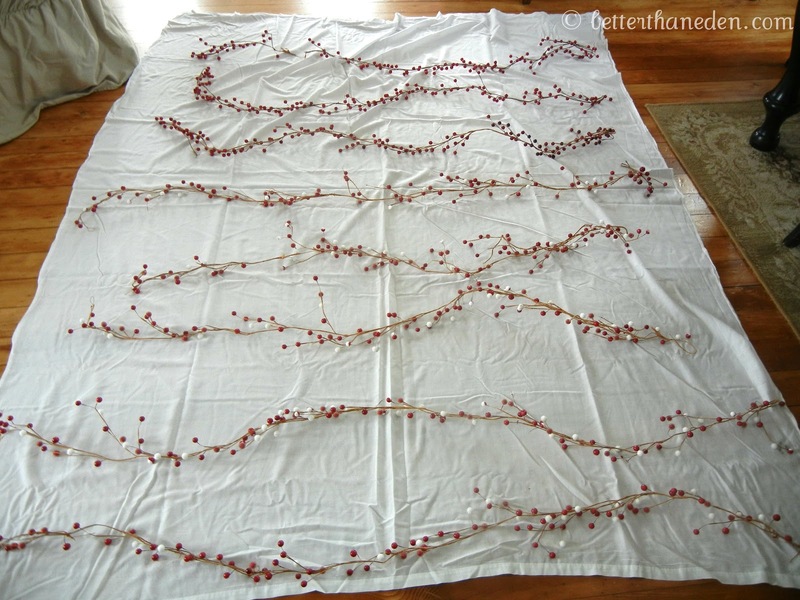 I tied it up to keep it from unrolling and the garlands are ready to store for next year, all tangle-free. It also resembles a burial shroud for a dead pet python. Brian saw it waiting to get put up in the loft and thought it was part of my Lenten decor. Like some weird take on the Passion? I don't know. I do often decorate with weird objects, I'll give him that much. Go see Jen now for others who are oh so much more creative, informational, and/or entertaining in their quick taking. That is awesome. If I was the type to do garland (maybe one day, hopefully one day I will be!!!) I will reference this for when it is time to put it away!!! what a great idea! I always lose berries to the jumble-in-a-plastic-shopping-bag method. Very clever! I have to agree with Brian - I love the berry garlands that you put up at Christmas time. You are so smart and Jen's missing out!